In October of 1967 the Bothell Squadron of Civil Air Patrol was formed. Sometime in the 1970’s this squadron changed its name to Northshore Squadron. 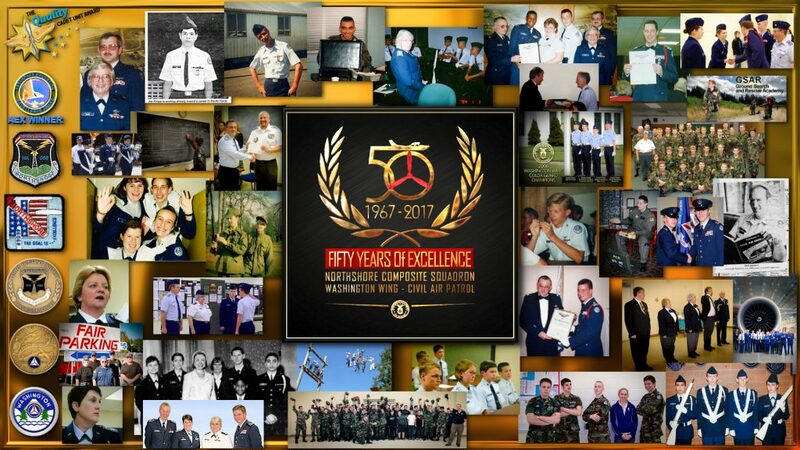 Throughout the years the squadron has earned numerous awards for cadet programs and aerospace education. There have been several color guards who have won many wing level competitions and performed at sporting events and ceremonies. 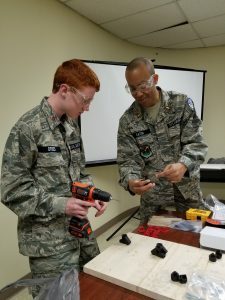 For the last six years in a row the squadron has earned the Quality Cadet Unit Award and Aerospace Excellence Award from CAP National Headquarters. The Northshore Squadron has been the home to many good members who have gone on to do outstanding things. Many of the cadets from this squadron have gone on to defend our nation, serving in all branches of the Armed Services. On October 21, 2017 the squadron will host a 50th anniversary celebration at the Hooper Army Reserve Center in Bothell, WA. If you were a member of the Bothell or Northshore squadron please plan on stopping by sometime between 5 and 8pm. If you have old photos or memorabilia you would like to share, please bring them with you. 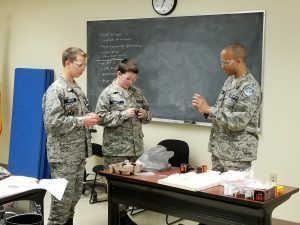 Northshore cadets, led by Aerospace Education Officer 2Lt Anthony Eaton, begin building a drone. 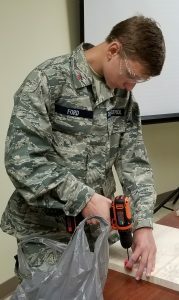 The drone, built from wood, plastic, and the cardboard box in which it came, will be completed and flown at the next Aerospace Education session, in July. The Northshore Composite Squadron is pleased to invite family, friends, and members of the public to attend its Open House Event. Drop by any time between 7 and 9pm on Tuesday, October 18, 2016 and learn how CAP serves the community and how you can get involved. Meet us at Northshore HQ. Click here for map and directions. On January 24th, 2015, Northshore Composite Squadron hosted its fourth annual Holiday Dining Out. The Holiday Dining Out is a treasured United States Air Force (USAF) tradition that brings together the members of the squadron to a formal dinner and dance to celebrate its own achievements and those of its members over the past year. 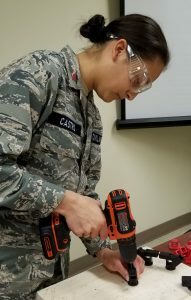 As the Auxiliary of the USAF, Civil Air Patrol (CAP) squadrons are also able to follow in this valued tradition. During the earlier portion of the evening, Northshore practiced both truly valuable and fun traditions. As with every year, time was taken to remember America’s fallen soldiers with the Prisoners of War/Missing in Action (POW/MIA) table. Color Guard members performed a symbolic ceremony that honored these men and women who have sacrificed so much for their country. Toasts were given to our Commander-in-chief, the four military branches, the CAP, and even the friends and family of Northshore. A slightly more entertaining tradition that Northshore holds every year is the grog bowl. The grog is also a tradition the Air Force practices. The grog is a large bowl filled with various ingredients. Some of these ingredients included: Gatorade, Worcestershire sauce, marshmallows, and pickle juice. If a member is found breaking protocol, as punishment, they may be called to go forward and drink a full glass of the grog bowl. Many senior members and cadets fell victim to the grog bowl during the evening. Once everyone had eaten a delicious meal, a few notable guests gave presentations. Of these guests were Washington Wing’s Commander, Colonel Jim Furlong, and one of Washington Wing’s former commanders, Colonel Ted Tax. Colonel Furlong and Colonel Tax also led a promotion ceremony for two cadet of Northshore as well as assisted in presenting awards to other outstanding cadets for their excellent contributions to the squadron. Once all of the formalities of the night came to an end, then opened a time for socializing and dancing. Overall, the Holiday Dining Out is a treasured tradition that Northshore holds dear to its heart. In the course of one evening, people have the chance to experience a beloved military tradition, see the successes of the squadron and its members, enjoy a wonderful meal, and enjoy the company of one another. Interested in visiting? Come join us this Tuesday (US ARMY Reserve Center 130 228th ST SW Bothell, WA 98021). Guests are always welcome. Visit our website for more information (capnorthshore.org).